Joe Smith and the Spicy Pickles : High-Fidelity. Vintage swing in the 21st century. Denver-based vintage jazz group Joe Smith and The Spicy Pickles present High-Fidelity, an album of all original swing music inspired by the classic small group sounds of the late 30's and early 40's. The concept behind "High-Fidelity" is to provide a smart recording of new, danceable tunes for the swing and blues communities. The album aims to give dancers and listeners alike more of what they love, but haven't heard before. The band leader and self-admitted purist, Joe Smith, deliberately cut out all of the excessive noise that detracts from the album's primary objective: delivering quality music. Devoid of crowdfunding, pretentious artwork, and politics, the music speaks for itself. 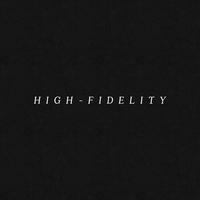 With the debut of "High Fidelity", the Pickles bring forth the band's identity. They do not intend to merely mimic the greats, but aspire to create new tunes that celebrate the refined spirit of pre-war swing and entertainment. Written with historic acumen in composition, arrangement, tempo, rhythm, and sound quality - along with true vintage instruments and set-up - the band crafts an accurate and authentic sound that reintroduces American swing to a new generation. As a group, the band honed their recording process and musicianship to provide a pristine sound that is decidedly unique. The album opens and closes with the band's theme song "Slow Cookin'" in an homage to the big band era's days of radio shows. "The Pen is Mightier" pays tribute to the small group Goodman sound featuring a melody played by Elijah Samuels on clarinet, Joseph Chudyk on vibes, and Al Scholl on guitar. Featuring Prescott Blackler on trombone and Adam Sammakia on bass, "The Baltiquerque Stomp" is a fast, driving number with a nod to early jazz. "Benny's Blues" is an ode to current New Orleans trumpet player, Ben Polcer, and "It's Alright for a Night" pays tribute to Cole Porter. The band takes inspiration from Billy Strayhorn and the Duke Ellington Orchestra for "The Gherkin Train", which features Elijah Samuels on tenor sax. All tracks on the album were composed and arranged by horn players, Elijah Samuels, Prescott Blackler, and Joe Smith. License Vintage swing in the 21st century by Joe Smith and the Spicy Pickles for your project. Play the music of Joe Smith and the Spicy Pickles in your restaurant or store. New Moon by Beth Quist: electro-Balkan / Indian meets New Age.